Kids Puzzle With a Beach Scene. Puzzle is 14" x 10". Pieces are 1/16" thick printed on cardboard. 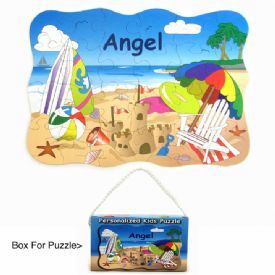 These kids puzzles will all have "Angel"
printed box with a cord handle to carry it. fun fair prizes as well as carnival toys bulk. We carry a variety of kids wholesale puzzles.